(Release Date: June 10, 2014)  At the opening of "25th Hour," directed by Spike Lee, two almost heavenly rays rise up from a post-9/11 skyline of New York City, the beams of light acting as a replacement for where the World Trade Center once stood tall and proud. It is a staggeringly powerful image, the first of several, that portray Manhattan as a place that has been forced under change beyond its control. A change is also looming over the head of 31-year-old Monty Brogan (Edward Norton). Caught and convicted of possessing a kilo of drugs with intent to distribute, Monty has exactly one day before he is to make his appearance at a maximum security prison, where he is to serve a term of seven years. As his two best friends, high school teacher Jakob Elinsky (Philip Seymour Hoffman) and Wall Street stockbroker Francis Slaughtery (Barry Pepper), prepare to take him out for a long night on the town as his last hurrah, Monty faces having to leave his beloved girlfriend, Naturelle Riviera (Rosario Dawson), and saying good-bye to his father (Brian Cox). More than anything, however, Monty wonders just how he could have let his life take such a wrong turn. In his eyes, he has exactly three options: go to prison and lose seven years of his life, go on the run and leave behind everyone he has ever cared about, or kill himself. In light of the devastating events of 9/11, Americans stood their ground, announcing their refusal to allow what happened change them. As in real life, the characters in "25th Hour" falsely believe this, not realizing that they have changed. What has happened in their country, mixed with their own natural experiences, has turned them into unavoidable cynics. Francis, for example, probably correctly tells Jakob as they look out from his apartment window overlooking Ground Zero that this is the last night they will ever see Monty. Time changes people and their relationships, no matter how close, and things can never be the same in seven years as they are in the present. Meanwhile, in a tour de force scene of shockingly harsh honesty, Monty stares himself down in the mirror, releasing a long, hateful diatribe against every race, class and ethnicity he sees around him or hears on the news before pointing the finger at himself. Written by David Benioff (based on his novel), "25th Hour" is especially astute to the way people think and react in life, as the cruel hands of change press down upon them. In one of his most distinguished turns to date, Edward Norton is captivating as Monty, a kind, caring man whose unfortunate choices have cost him his life. Visiting Jakob at the same high school he once went to, Monty sees a picture of himself from when he was a star player on the basketball team, and considers the bright future he once had ahead of him. And in the present, he cares for a dog whose life he saved as a reminder of the good he has the capacity of doing. Norton gets all of the nuances and character shades just right in his portrayal of a man quietly at war with himself. The supporting cast lend excellent support. The late, always dependable Philip Seymour Hoffman gets effective screen time as Jakob, an introverted bachelor who, in a moment of carelessness at a nightclub, kisses his 17-year-old student, Mary (Anna Paquin). As the opinionated Francis, Barry Pepper is just fine, although his character is the most weakly written of the principles. A climactic emotional breakdown he has comes off seeming over-the-top rather than the dramatic powerhouse it was intended to be, though no fault of the actor's. Rosario Dawson is radiant as Naturelle, a tricky role in that it is never clear until the final act whether she turned Monty in to the police, or is completely genuine in her devotion. Dawson pulls off this difficult coup like a pro. Rounding out the top-notch leads are Brian Cox, as Monty's caring father, and Anna Paquin, equally soulful and childishly naive as Mary. In a poignant alternate reality, Monty imagines what his life might be like if he were to bypass prison and go on the run. Director Spike Lee leaves the actual finale and some key subplots open-ended, forcing the viewer to draw their own conclusion as to what choice Monty ultimately makes and what happens to the other characters. While this approach could have potentially been frustrating, Lee makes it work. "25th Hour," while not always hitting the bull's-eye, indelibly works its way underneath the skin. The key to the film's cumulative success is that it understands its characters and the flawed world they live in, and cares about them. 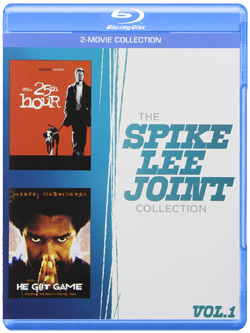 The 2-disc "The Spike Lee Joint Collection, Vol. 1" also includes the filmmaker's 1998 film, "He Got Game," starring Denzel Washington, Ray Allen, Milla Jovovich and Rosario Dawson. The 1080p transfer of "25th Hour" is a faithful rendering of difficult source material. For the aesthetic of the picture, Spike Lee and cinematographer Rodrigo Prieto adopt a variety of diverse film stocks that boost the grain output and overall grittiness of its setting. In one segment during an Edward Norton interior monologue, the contrast turns sizzling hot, magnifying the high-definition details of the image while boosting the colors to a practically radiating level. Blacks are strong, print damage is almost nonexistent, and, while noise is apparent on occasion, it also looks to be intentional. The 5.1 DTS-HD Master Audio is affectingly active, with voiceovers swirling across all corners of the sound field and the music (particularly in an extended scene at a nightclub) positively propulsive. This is a complex sound mix, and the lossless quality of the audio ensures it is as good as it has ever sounded on home video. The 1080p transfer on "He Got Game" is a little more problematic, looking to have come from a dated master. The opening credits scene is full of mosquito noise and the intermittent flash of neon falls victim to color bleeding. At the same time, this is still definitely a step above the original DVD release from 1998. Some shots are jolting in their level of clarity and boldness, while others appear slightly worn. The uptick in detail, however, makes it an overall satisfying picture, even with its trouble areas. The 5.1 DTS-HD Master Audio is superb, placing the viewer in the middle of the action on the basketball courts. Dialogue is crystal-clear, while the title song by Public Enemy during the end credits features an outstanding fullness and range. Just because "The Spike Lee Collection, Vol. 1" is a double feature doesn't mean this is a throwaway release for Disney/Buena Vista. It would have been preferable for "25th Hour" and "He Got Game" to get separate releases, but both films have at least been afforded their own disc. Furthermore, both movies come with brand-new audio commentaries with Spike Lee, accompanied by Edward Norton on the former track and Ray Allen on the latter. It is a great package set at a highly reasonable price point, and comes highly recommended.